Okra or ladies fingers are known as Bhindi/Bhinda in Hindi and are a hugely popular vegetable in Indian kitchens. 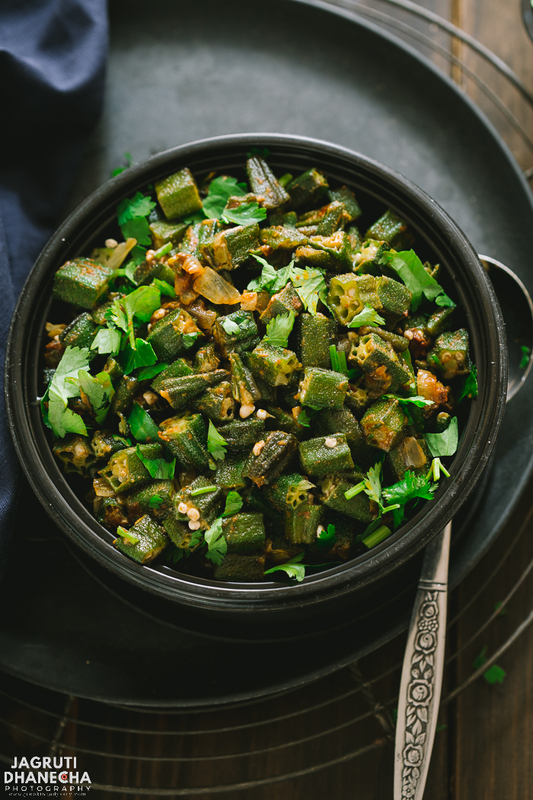 Although some have a love/hate relationship with okra, the majority of Indian kitchens always welcome okra once in a week. I have seen families where one won't like okra, but the other member can't get enough of it. In our family, also there is the same opinion, one like it, one doesn't but we have come to decide that no one has to love okra, but think of health benefits and just eat it and it works fine. The Kashmiri Bhindi is a mild spice preparation cooked with fresh okra, onion and a special blend called 'Kashmiri Masala'. 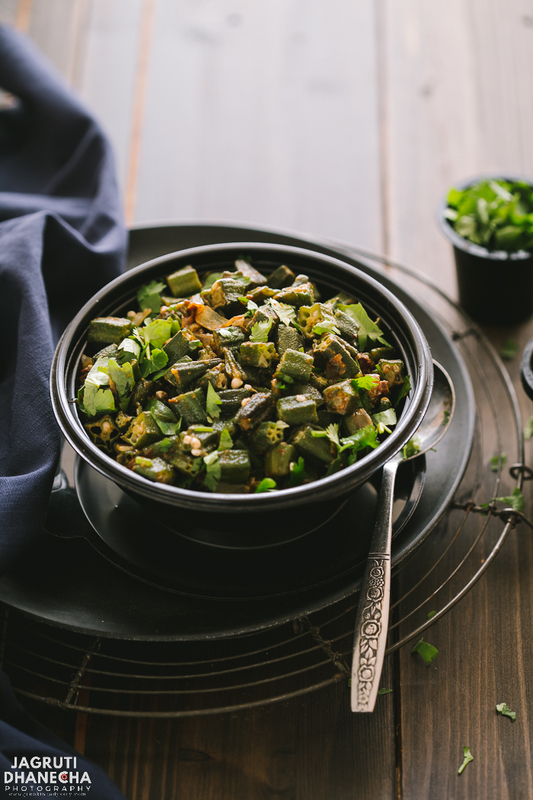 It is dry and it is quite different from the other popular Bhindi/Okra recipes out there. Kashmiri Bhindi is flavoursome yet light without any overpowering flavours. Definitely, do not require tons of spices and ingredients and also comes together in less than 10 minutes on the table (when you have already cut bhindi). This vegan, gluten-free and straight forward recipe is perfect with robust dishes such as Daal Makhni, Dhaba style daal fry or Rajma ( Red Kidney Beans Curry ), plain rice and roti. India is a huge country with a population of 1.3 billion and 29 states, although every region of India is connected with the curry, every region has their own methods of cooking and blend of spices. There are various blends of spices you can find like Punjabi Masala, Hydrabadi Masala, Amritsari Masala, South Indian Masala and Kashmiri Masala. In this masala blend, most of the ingredients are same but there is a one or two special ingredient from that region makes that blend unique. Kashmiri or Bassar Masala is a fragrant blend of spices consists of fenugreek seeds powder, turmeric, cumin and coriander, Kashmiri red chilli powder, tandoori masala powder, paprika and olive oil. Bhindi/Okra - When you choose the bhindi, look out for firm, fresh and bright green colour bhindi. If the end snap of easily, the bhindi is at it's freshest. When preparing the bhindi at home, rub lemon juice over the knife to prevent sticking and make sure the bhindi is dry before cutting. Kashmiri Masala - It is easily available in any Indian/Pakistani grocery shop. Maybe in Pakistani shop, it is known as Bassar Masala. This masala can be prepared at home. Onion - You can use white or red onion for this recipe. Oil - Any flavourless oil works fine. Spices - Apart from Kashmiri masala you will need ground cumin and coriander. First, prepare the okra by washing them in running water and completely dry it with the kitchen towel. Cut into 1/2" pieces. Heat oil in a kadai or heavy bottom pan, add asafoetida, then chopped onion and fry just a couple of minutes. Add okra pieces and cook both on high heat for at least 5 minutes. Keep stirring. Add ground cumin and coriander, green chillies and salt and cook for another 2-3 minutes. Stir in fresh coriander leaves and cook further 2-3 minutes or you see onion getting brown and caramelised. Add Kashmiri masala, mix well and cook another 2 minutes. A light, quick and vegan dish that is sure to tickle your fancy. First prepare the okra by washing them in running water and dry completely. Heat oil in a kadai or heavy bottom pan, add asafoetida, then chopped onion and fry until translucent. Well this would be a test for sure. I have yet to find an okra recipe I like. Maybe this will be just the one. I honestly have never tried okra before because the texture seems unappealing, but your recipe makes me want to try it! You have beautiful photos that are very enticing. My husband and I love okra and although some people complain about the texture it never bothers me at all. Your recipe sounds really tasty and would make a lovely side dish next time we have curry night! Thanks Corina, yes you are right most of the people don't like okra because of it's texture, but if cooked right, okra dishes are quite enjoyable. Fortunately hubby and I both like okra. I've never seen it prepared this way and I like what I'm seeing. It looks delicious and easy!! This is now on my to make list when I can get okra here in my area!! Great recipe as always, Jagruti! Thanks Elaine for the lovely words, hope you guys enjoy it. I love Indian food, but really haven't had okra that much. This looks delicious - I'm going to grab some on my next shopping trip for sure! Thanks STCD, hope you guys like it. I also love Indian cuisine, but I don't think I've actually tried okra before. Your dish and the recipe looks gorgeous, the presentation is definitely making my mouth water! Thanks Anna :) You must try once. Oh my gosh I adore Okra! This recipe looks out of this world. DO you think I could use frozen okra? I know it's not the same but it's hard to get fresh okra around here. My husband grew it for the first time last summer and this year he's going plant a lot more of it! I'm so happy I found this recipe! I love okra but never think to make it. 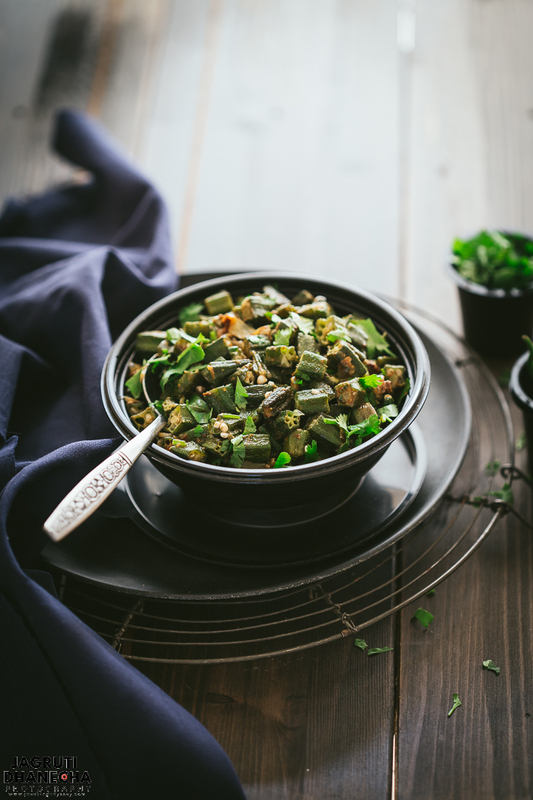 This is the perfect okra recipe. Thank you for posting! We really like okra and put it in quite a few dishes. We haven't tried it like this -- will certainly give it a try. But, I have never seen okra as beautiful as yours. The kind we find seem to have places on the outside that aren't as perfect. Will keep trying. This sounds so interesting! I've never really cooked okra but know many people who really like it so may have to give this a try.